I've lived in New York City since April of 2010 and one statement that I frequently hear from New Yorkers when the "Mid-Summer Classic" is brought up in conversation is "I don't care about the All-Star Game," and it baffles me every time. I suppose no one has much to be happy about when it's 90+ degrees in New York City but I've always thought fondly of the All-Star Game no matter what city I call home. It's a defining moment as the pennant race really intensifies at the half-way marker in the season. As for the festivities, I always enjoy watching the camaraderie among the players from rival teams within the leagues especially during the Home-Run Derby, although I do admit these events can place unnecessary strain on the players involved. Perhaps one should consider the notion that New Yorkers have a reputation for having a more traditional and serious outlook on baseball and it may be that they view the All-Star Game as a distraction from their most important goal at that point in the season: being champions of their division! Perhaps I can understand the indifference of Yankee fans regarding the All-Star Game. 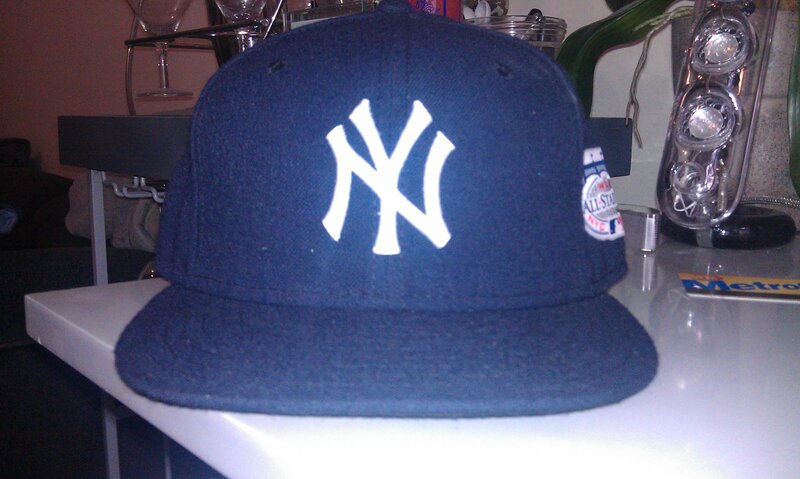 Understand that the last time the Yankees missed the post-season was 2008, which is also the final season that they would play at Yankee Stadium I (aka, the House that Ruth Built, 1923) and it's also the most recent year that they have hosted the All-Star Game. Maybe it's just a case of many emotions being swirled around in the same pot, but it's also possible that Yankees fans view their entire team as "All-Stars" and simply have no need for the dog-and-pony show that the All-Star Game can be at times. Either way, I enjoy the dialogue and am always open to hear any discussion on the subject of the All-Star Game, especially as it pertains to baseball in New York City. Personally, I welcome the All-Star Game if for no reason than that it gives me an excuse to purchase a new cap simply because of the commemorative felt patch on the wearer's left side. 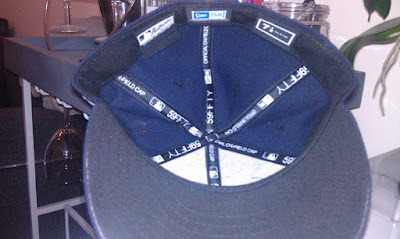 The 2008 All-Star Game logo is remarkable because of it's elegant simplicity (a classic trait for the Yankees) as well as the obligatory use of the frieze (otherwise described, albeit incorrectly, by Yankees fans as " the facade") making this cap a must-have item for Yankees fans and cap collectors. I often see this cap worn by fans at Yankee games and while the odds are not in favor of everyone wearing this cap having attended the 2008 All-Star Game, it is very likely that they are wearing it to give their propers to the legacy of a team and its ballpark that will continue to define excellence in the most challenging circumstances. That's why I wear mine! 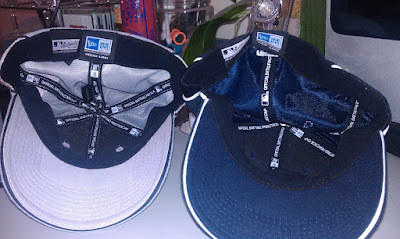 The two caps pictured below the on-field gameday cap are the batting practice caps which are also worn during the Home-Run Derby. Even though by 2008 all New Era Authentic Collection caps were made of polyester, the mesh-like fabric of the batting practice cap make it an ideal cap to wear if perspiration is on your agenda. 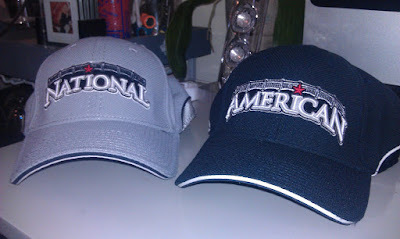 I picked up both the American and National League batting practice caps because of my longtime love for my hometown team before I came to New York: the San Francisco Giants. 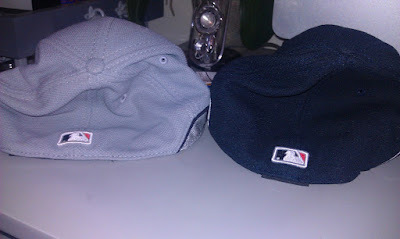 As a matter of fact I came across a photo of the old-timers wearing the game-day caps and I've got to admit Willie Mays looks pretty sharp in a San Francisco Giants cap with the 2008 All-Star Game patch on the side. 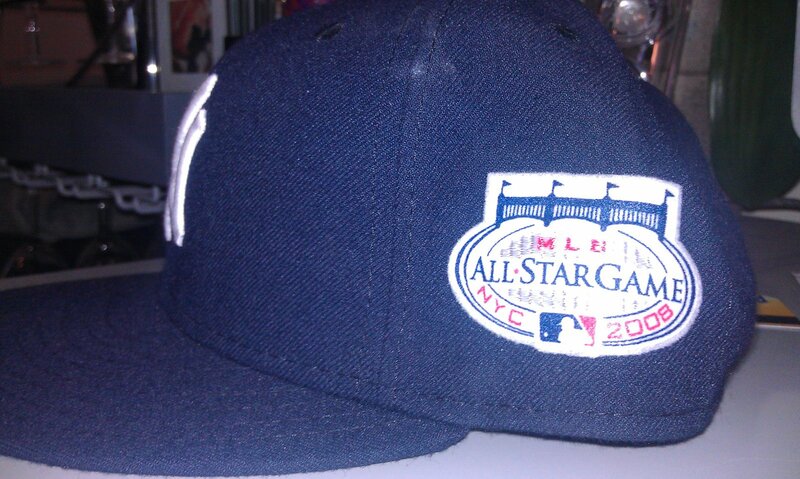 In my obsessive hoarding nature, I managed to come into possesion of a 2008 All-Star Game cap that I purchased just for the patch and now I'm wondering how I would look in one like Willie's. Definitely not as sharp as he does, but pretty close I bet. Let me know if you have any suggestions on how to apply glue to these patches to get them on to an alternate cap.